Description: caught this one one evening in jaunary. Description: We watched the Conductor spill some sort of drink out of his cab window as it approched the summit. Description: BNSF 9859 / BNSF 9308 / BNSF 6091 (DPU) / BNSF 5977 (DPU) - Train E-IOGCDM0-28A - Departs Dobbin after a new crew gets on board. Description: Helper sets wait in Crawford for the next load to push over the hill. Description: Empty coal train rolls along the Spring River on BNSF's Thayer Sub. 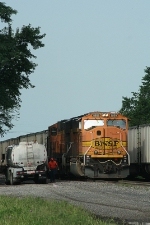 Description: Spring has arrived on BNSF's Thayer Sub. Description: Empty coal train departs Thayer. Description: EMD and GE DPUs push this coal load down the Joint Line. Description: Westbound Roberts Bank coal loads descend Providence Hill behind a "peach MAC" on the Lakeside sub. 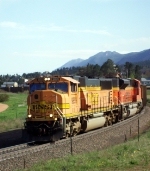 Description: BNSF 9859 was built in December 1997. Description: Built December 1997; 8858 built April 1999.